Another key type of foresight thinking is influencing. Influence is a key way the foresight professional communicates the value of their work, and motivates the client to execute foresighted strategy and plans. Personal influence starts with understanding the mindset (world view, assumptions, emotional state) of the client and their culture, which is often less future-oriented, and more change and risk averse than the foresight professional’s own mindset. Learning self-restraint, and knowing when saying less will yield more results, is a major part of the learning curve of many young practitioners. As mentioned earlier, books like Covey’s The Speed of Trust (2008) and Reiger’s Breaking the Fear Barrier (2011) will help the foresight professional understand their client’s current innovation capacity and their own potential for influence, and offer guidance for ways to grow influence. The more times the Do loop can be run by the client and the foresight professional together, achieving and documenting small wins, the more credibilty can be built for subsequent major foresight initiatives. Influence is also a key skill our clients need to succeed in the market. We human are all natural imitators and influencers, and have been since the birth of our species. Here’s a good story: two million years ago a few of our Homo habilis ancestors, after millennia of being the favorite food of jaguar-sized cats, picked up sharp rocks and clubs to defend themselves. What made our species special is not the tools themselves but our inclination to use them in large numbers, imitating each other, to suddenly become the dominant life forms on the savannah. Human beings are always selling ideas and behaviors to each other. Our species great imitative and influencing strengths are also at times weaknesses, as manias, fads, and urges to mass conflict can also take hold of us at times. Today, media and markets are our greatest way to quickly influence others into mass behavior. Thus for modern organizations, the key influencing specialties are Marketing & Sales Management. Advertising, Business Development, Lead Generation, Market Research, Customer Service, and Customer Relationship Management (CRM) are all applications of this skill. The American Marketing Association (AMA) is a key marketing practitioner community, and the National Association of Sales Professionals (NASP) a leading sales practitioner community. 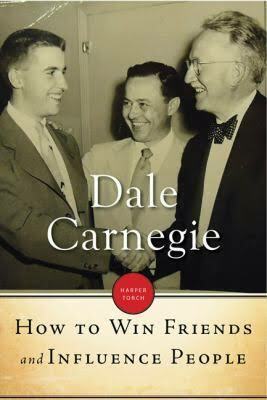 Dale Carnegie’s How to Win Friends and Influence People (1937/1998) is the classic primer on personal influence., which we considered in Chapter 2 (Personal Foresight). Warren Buffett called this “the most successful self-help book of all time.” Like other classics, it is worth reading multiple times, until its advice is emotionally and cognitively automatic. But as reviewer Andrew Parodi reminds us on Amazon, according to Kemp and Claflin’s biography, Dale Carnegie: The Man Who Influenced Millions (1989) Carnegie intended to include a final chapter, about the need to take a break from, or establish borders and reduce contact with, that subset of people you can’t get along with. Carnegie left this unfinished chapter out of the manuscript when offered a trip to Europe. That decision gave us a great book on influence, but one with few lessons about identifying and treating differently that small subset of people whom you can’t influence after many good efforts on your part, due to their extreme, overly dominant, egotistical, unethical, borderline, or sociopathic personalities. Recall that we discussed a subset of such individuals in Chapter 2, in the subsection “A Sixth Trait – Social Dominance?”. This is actually Relating advice (Skill 7, Relationship Management), but it is worth discussing here, in the context of mutual failure of influence. In such circumstances, it will be your occasional responsibility to seek to get such individuals off your team, or at least out of key management positions. If such an individual is your relationship or business partner or client, and if either of you has been unable to influence the other, despite your best mutual efforts, a relationship holiday or divorce may be the best course for both of you. If limiting or eliminating contact isn’t enough, a lawsuit or direct competitive challenge may be necessary as well. If sued, don’t shrink from defending yourself, but be slow to your own anger and legal action. Personal and commercial success, on your own terms, is always the best “revenge”, if you feel an injustice has been committed against you. Sales specialty classics that every CMO or CSO should own and use in their organizations are Miller and Heiman’s The New Strategic Selling (1985/2005), for general sales development, and the New Conceptual Selling (1987/2005), the latter for face-to-face interactions. Mack Hanan’s Consultative Selling, 8th Ed. (1970/2011) is also a classic that focuses the sales effort on delivering measurable value to the client, improving their margin, revenue or profit in a clear way. See also Rackham’s inspirational classic SPIN Selling (1988). Among more recent books, Daniel Pink’s To Sell is Human (2013) and Robert Cialdini’s Influence (2006), are both good primers on the way we use reciprocity, social proof, consistency, commitment, liking, authority, scarcity and other factors to shape our influence over others. Motivational books like Tom Hopkins’ Selling for Dummies (2007) and Frank Bettger’s How I Raised Myself from Failure to Success in Selling (1992) will also help you get better at the influence skill. As with all of the Eight Skills, your psychological traits (eg, extroversion vs. introversion, woo vs command) will greatly influence your baseline influence abilities. As personal traits are slow to change, the best strategy to rapidly grow organizational influence is to recruit team members who are naturally excellent at this professional skill, and give them leadership positions, freedom, incentives, and resources to address key marketing and influence challenges. In recent years, behavioral and social psychologists and economists are discovering just how strongly and predictably we are influenced by our environment and social networks. Books like Thaler and Sunstein’s Nudge (2009), Dan Ariely’s Predictably Irrational (2010), and Sandy Pentland’s Social Physics (2014), all make clear that environmental design and our choice of peers have major impacts on our thoughts and behaviors. We take most of our cues from our associates and environment. For example, organ donation rates, savings contribution rates, and many other personal decisions have shown 15-90% increases in participation based simply on switching environmental conditions from default opt-out to default opt-in (presumed consent). The UK government now its own “nudge unit” (Behavioral Insights Team), and the first US Obama administration (2008-2012) employed Cass Sunstein, a pioneer in this area. See Sunstein’s Why Nudge? (2014), for more on how public issues like obesity, smoking, distracted driving, crime, corrections, education, safety, and many others can all be greatly affected by nudging influences. This is a form of “libertarian paternalism” that we can easily predict will grow in all our increasingly foresighted societies in coming years. Foresight consultants use influence in all stages of their work, including the initial client proposal, workshop facilitation, product development, service delivery, and review of their work. To have influence with clients, foresight work needs both relevance and credibility. The message also must be tailored to the client’s abilities and needs, without sacrificing its ability to improve adaptation.